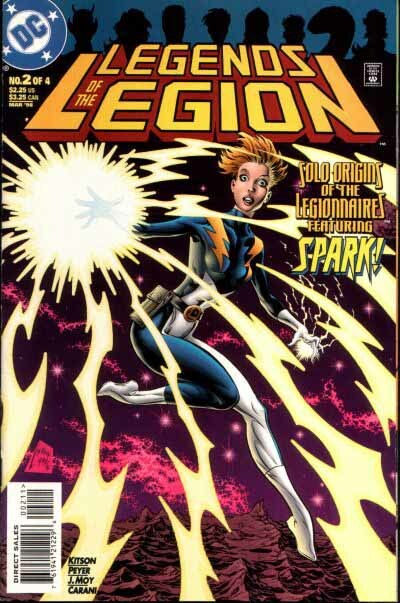 In 1998 two new Legion mini-series were published. This one, focused on the policing aspect of the group, featured a logo designed by Steve Vance. Here’s the final logo sent in by Steve, produced on the computer. It has heavily-outlined slab-serif letterforms leaning back in one-point perspective, and a stylized starburst in the O from the character symbol used in the stories. LEGION is smaller, with the emphasis on SCIENCE POLICE, perhaps an attempt to market this book to fans of police TV shows. A drop shadow, here in gray, gives it more pop off the cover. Nicely done. The other 1998 miniseries was this one, with a logo by me, also produced on the computer, though I think it began with a hand-drawn sketch that I no longer have. By coincidence, it has a similar layout to the Vance logo above, with angular open block letters, though the telescoped open drop shadow adds a second vanishing point below for a resulting two-point perspective. On the cover, a series of Legion head silhouettes added considerably to the design. Those were all cover artist Steve Lightle’s idea. 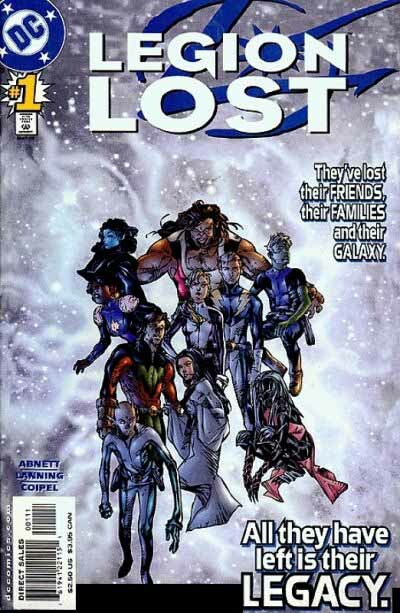 At the end of the 1990s, the Legion books were dropping in sales, and the two regular Legion titles were wrapped up and followed by this 12-issue series written by Abnett and Lanning. 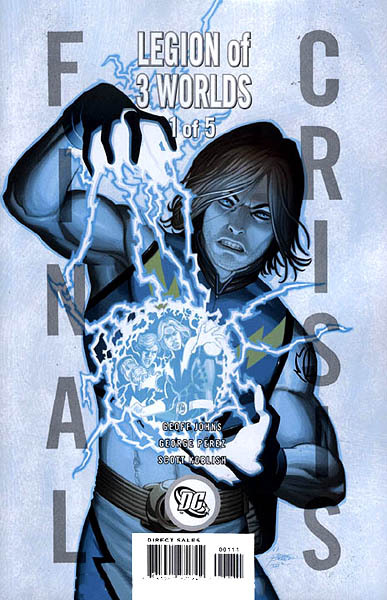 Curtis King worked with designer John J. Hill on the logo, though Curtis thinks he himself drew the distressed Legion symbol in the background. The letters are slightly modified sans-serif type. My favorite part of this logo is the starburst from the symbol centered behind the O. It’s an attractive, very readable logo typifying the trend toward using commercial fonts in comics logos rather than hand-drawn ones. The series was a success and led to this second mini-series with a logo by Josh Beatman of Brainchild Studios. Beatman followed the popular route of using very worn or distressed type for his letterforms, with the O being a barely recognizable version of the old Legion symbol (similar to the one behind the type in the previous book). The letters are much thinner and more widely spaced than most previous Legion logos, which gave it a fresh look, and the overlapping words were a good idea, saving some cover space. But the most surprising thing about this logo, which I learned when contacting Beatman, was that he designed the entire cover, including all the floating, orbiting type, star charts and graphing symbols. Here’s what Beatman turned in, minus the cover art. A much more complex job than it would first appear, and I’m sure a ton of work. Very impressive! With the Legion once more in the ascendant, a new monthly book was launched with the same creative team, and using just the word LEGION from Josh Beatman’s previous design. This title lasted for several years. For most issues the logo ran across the top, but on this first issue it ran up the left side (correctly putting the bottoms of the letters toward the art), so another title was placed across the top, with small type in front of large, blurred type. It would seem like overkill, but the cover is well designed, and it works. Beatman probably designed this version too. 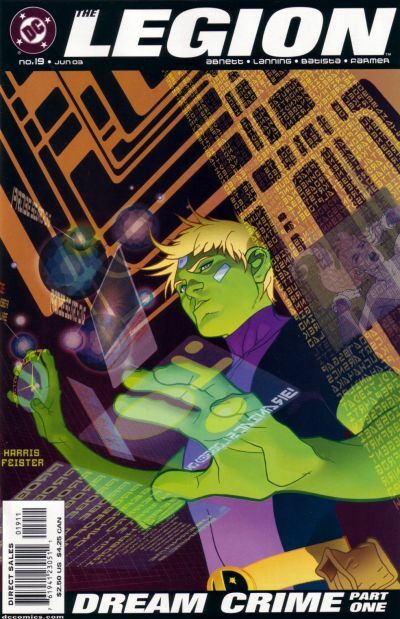 With issue 19 in 2003, the design changed, featuring a logo and cover lettering in a heavy, bold, italic sans-serif font. Not sure who designed this one, but the logo has lost any reference to the characters or symbols of the series. It does leave lots of room for cover art, and is certainly very readable, but it might as well be a logo for “Newsweek.” The one small creative touch is putting THE in the L, which works fine in this case. The top one used the ADVENTURE logo by Ira Schnapp for inspiration in the word LEGION, while SUPER-HEROES was closer to the letterforms of Ira’s title boxes, but with more rounded shapes in the curved letters. I extended the outer strokes in each S. Not sure why, I just liked the way it looked. The OF was in the style of Schnapp’s script lettering, though with square corners, more typical of Gaspar Saladino. The box behind was also from the Schnapp ADVENTURE logo, as it appeared when the Legion began there. 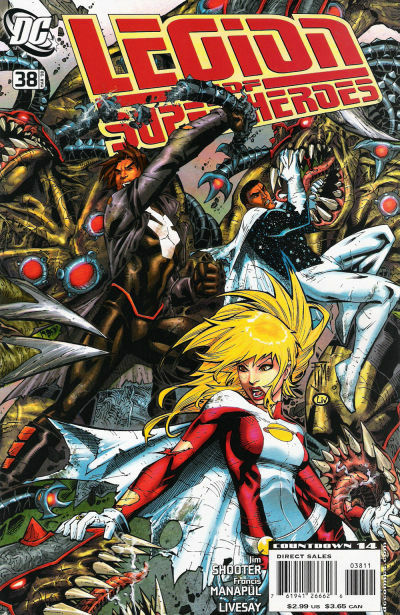 The lower version had LEGION in the same style as SUPER-HEROES, and DC liked that better. I think it looks great on the first cover, with the character heads in place, and a nice color backdrop in the box. And the stories by Mark Waid and Barry Kitson were great fun, too. 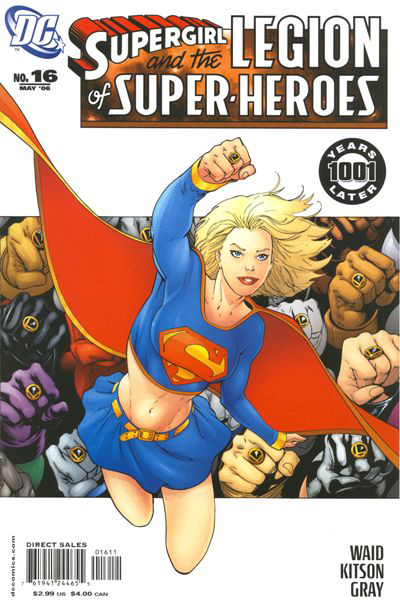 For issue 16, Supergirl would be joining the team and the logo, which once again brought the problem of a very long title. I submitted this version, increasing the logo to three lines, with SUPERGIRL in the same style as SUPER-HEROES, putting AND THE in the style of OF. DC decided that made the logo area too tall, though (and I agree!) and reworked it, removing the character circles and using the SUPERGIRL logo I had done years ago, building GIRL in the same style as the Milton Glaser revamp of Ira Schnapp’s SUPERMAN logo. AND THE floated in the box without an outline. A little hard to see, but that doesn’t matter, really, the important words are clear. 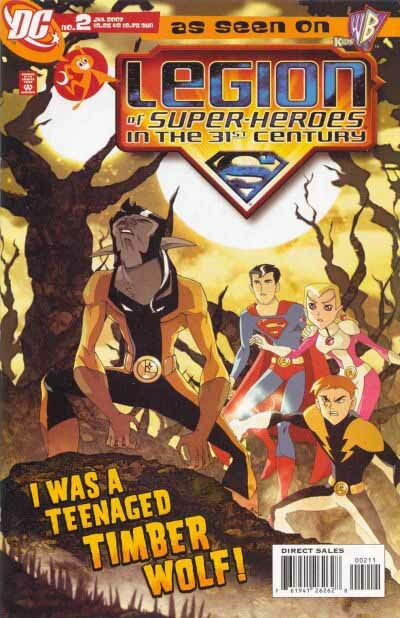 The “LSH in the 31st Century” book has the logo for the second season of the cartoon, minus the “in the 31st Century” text. The first season’s logo was basically the same but with a red S-shield instead of a transparent blue one. The logo itself was created by a team at Mattel, according to an account (I found online) which doesn’t seem to be there any more. Apparently WB Animation had come up with some preliminary logos, but DC wasn’t happy with them. So Warner Bros. Consumer Products contacted Frank Varela’s group at Mattel, where he’s a graphic designer. “The criteria given to me by WB was to be sure to have the Superman ‘S’ shield incorporated into the design since Superman is the main character of the show.” After a few iterations, DC liked one version and with some tweaking, it became the current logo. 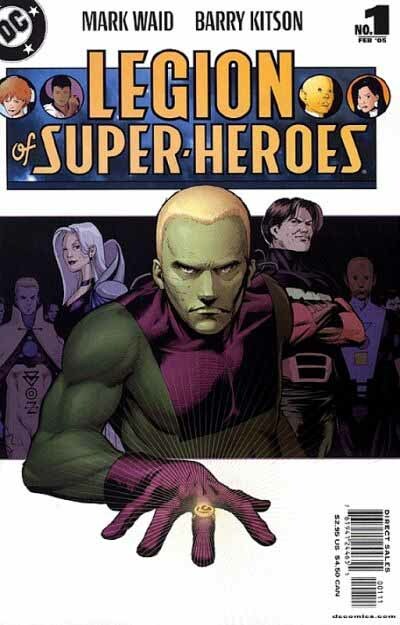 In 2007 DC was planning a new creative team for the main Legion book, and wanted to herald the return of writer Jim Shooter (who had last worked on it as a teenager in the 1960s!) to the book with a new logo. They asked JG Roshell of Comicraft to design it. JG has been kind enough to share some of his design work with us. What some these designs have in common is a creative use of letterforms with small gaps and bites taken out of them, while others suggest futuristic computer fonts. I have to say my favorite is the last one, but they’re all interesting, and show that JG put a lot of thought and time into this assignment. …but the final version was simpler, with a heavy outline to make it more readable and only a thin drop shadow below the open letters. Here’s the first cover appearance from 2008, looking very handsome, and it holds up well against the busy cover art, even somewhat obscuring the logo. That would never have been done in the old days, when a new logo appeared on newsstands with no warning and buyers had to be able to recognize it instantly, but these days buyers usually know what the cover will look like before they go out to buy it, and as long as the word LEGION is clear, the logo’s job is done. This series ended with issue 50 to make way for yet another Legion revamp. 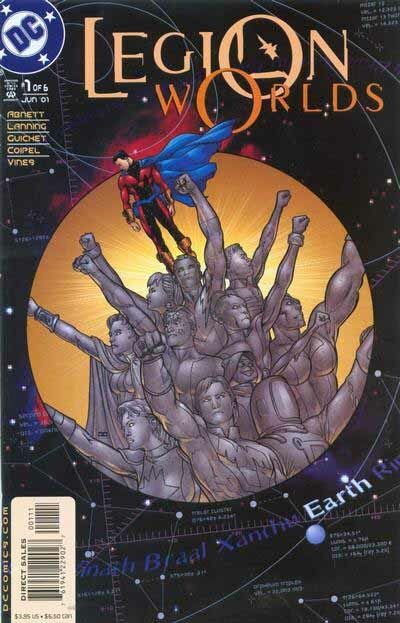 And to prepare for that, a miniseries, LEGION OF 3 WORLDS came out, part of the FINAL CRISIS event. The logo here is really more like cover type in a tall, condensed sans-serif font. Don’t know who did it, but I think the overall Final Crisis layout is by designer Chip Kidd. 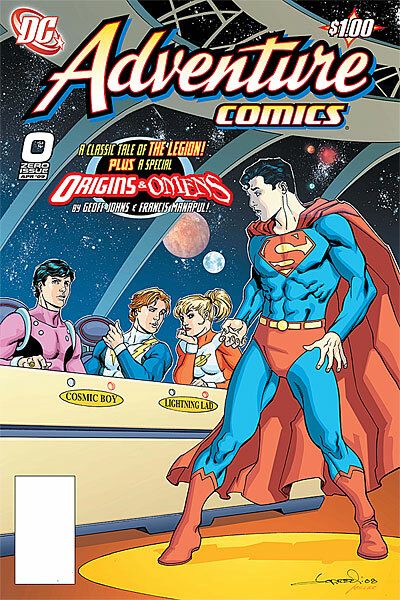 Writer Geoff Johns and artist George Perez had a great time depicting every Legionnaire in the series’ history, and multiple versions of many of them. And that new launch? It goes right back to the very beginning for inspiration, recreating the first Legion appearance on the cover of ADVENTURE COMICS 247 from 1958, more than 50 years ago. 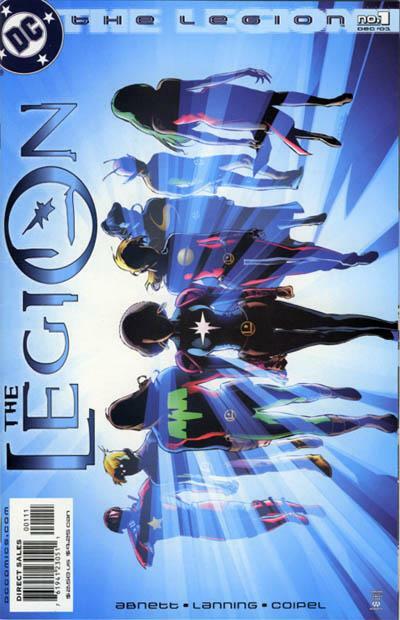 As then, the Legion name does not appear as a cover logo. I don’t know who designed it, but this new ADVENTURE logo is based on the original one by Ira Schnapp, and the main word uses the Comicraft font “Spills,” with a slightly modified A. There you have it, a legion of Legion logos by a legion of logo designers! Hope you’ve enjoyed this revised study. Other chapters and more logo studies can be found on my LOGO LINKS page. This entry was posted in Logo Studies on October 9, 2009 by Todd. Great series, Todd. ADVENTURE was the first comic I had a subscription to back in the early 60’s, so this study really meant a lot to me. Looking forward to the next one! Wow. That’s some series Todd! Thanks for the all the info and the trip down memory lane (even though I’ve never been a big Legion fan). 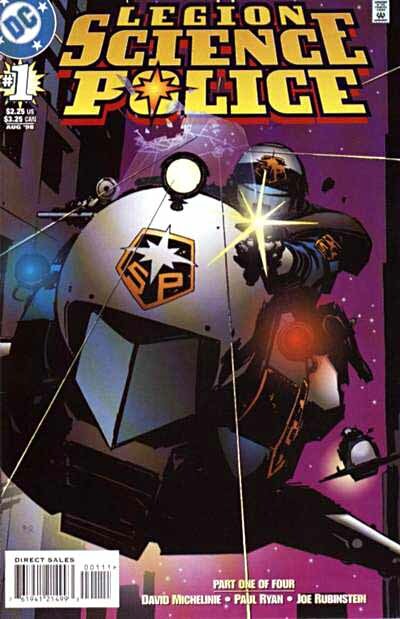 There was a “Legion Science Police” book? Don’t remember that one at all… Legion Science Police…(scratching head)? Where do you find all this stuff? Thanks, Jose. I use the Overstreet Guide and the Grand Comics Database website for research, and have a lot of material from the DC files and my own files, too. Thanks so much – so many logos! My favourite here is your Silver Age inspired masthead for the Waid/Kitson threeboot – it’s majestic. There are still at least two Legion-related logos missing: the two R.E.B.E.L.S. series (1994 and 2009). I decided to skip those because I felt it strayed too far from the focus of my study. Maybe some other time. Shooter also wrote the Legion in the mid-70s. Per the GCD, he was active from Superboy and the Legion #210 through #224, mid 1975-early 1977 cover dates.